Biography of a Wing Chun Master Sam Kwok 郭思牧 was born in Hong Kong in 1948, the son of a Church Minister. His interest in the martial arts started at an early age, his first experience was in White Crane Kung Fu, under the guidance of his uncle Luk Chi Fu. 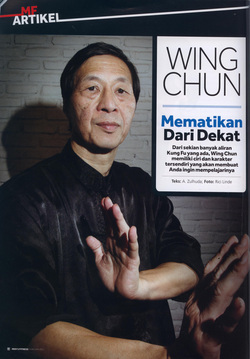 His Wing Chun training first started in 1967 under Chan Wai Ling in Hong Kong. In 1972 Samuel Kwok came to the UK to study psychiatric nursing and pursue a new life. Living in London then, he went to the Church of Reverend Kao, who told him about one of the congregation, a Wing Chun teacher called Lee Sing, who started teaching Samuel Kwok in 1973. In 1978 returning to Hong Kong in hope to find the true source of Wing Chun, Samuel Kwok was introduced to Ip Chun by Lee Sing; who at the time was joining the Ip Man Martial Arts Association. It was during a second meeting with Ip Chun that he offered to teach Samuel Kwok the Wooden Dummy techniques, realizing that he was being given a great honour he accepted. At this time, Ip Chun was only teaching part time. For the next few years Samuel Kwok had private tuition from Ip Chun and after gaining Master level in Wing Chun, he opened his first school in Hong Kong and it was not long before his students began making a name for themselves at tournaments and demonstrations in the colony. When returning to the UK, in 1981 he was appointed chairman and senior overseas representative of the Ip Chun Martial Art Association by Grandmaster Ip Chun. Having settled in the UK, Master Kwok started to teach Wing Chun privately but later he opened his first school after great demand from several martial arts enthusiasts. In his bid to promote Traditional Wing Chun and his Si-Fu, in 1981 Master Kwok held the first of many seminars in the UK for Grandmaster Ip Chun. In 1991 Master Kwok invited both Grandmasters Ip Chun and Ip Ching to the UK, to held their first joint seminars across the country. This was the first visit to the UK by Grandmaster Ip Ching. In 1994 Master Kwok returned to Hong Kong to study with Grandmaster Ip Ching. Also In 1994 Master Kwok introduced Steve Lee Swift from New York, to Grandmaster Ip Chun and helped to organize some very successful seminars in America, taught by Grandmaster Ip Chun. In 1995 once again Grandmaster Ip Ching was invited by Master Kwok to the UK, to conducted several seminars across the country but this time he was accompanied by Grandmaster Chu Shon Tin, one of the first students in Hong Kong of the late Grandmaster Ip Man. Also in 1995 the two famous brothers Grandmaster Ip Chun and Ip Ching visited Chicago to teach together for the first time in America. Again, this visit was arranged and assisted by Master Samuel Kwok. The Samuel Kwok Wing Chun Martial Art Association has now grown to become one of the largest Kung Fu organizations in the country. With students in Europe, U.S.A., South Africa and Australia; it has now become international. Although Master Kwok has many students teaching for him, he has always remained faithful to true Wing Chun tradition and still teaches classes personally. In 1998 Master Samuel Kwok received a BA honour from Manchester University for his life time achievement and promotion of Martial Arts. Today Master Kwok is constantly promoting Wing Chun across the world by conducting and organizing seminars, competitions, demonstrations, books, videos and helping the B.C.C.M.A. promote Chinese Martial Arts. He also helps to arrange tours and training in Hong Kong with Grandmaster Ip Ching for his students, showing that like himself he wants his students to benefit from this great master first hand.